The Germans live mostly in Germany. In Russia they are present in South-Western Siberia (Altay Republic, Omsk, Novosibirsk, Kemerovo, Tyumen, Tomskaya Oblasts, Krasnoyarsky Krai and Repubic of Khakassia), Volga region (Orenburg, Volgograd, Saratov oblasts, Krasnodarsky Krai, Republic of Kalmykia), Urals (Sverdlovsk), Northern territories (Komi), Far East (Irkutsk, Chita Oblasts, Republic of Buryatia), Western parts (Kaliningradskaya Oblast, Moscow, Saint Petersburg). There are Siberian and Central Asian Germans, Volga Germans, Ukrainian Germans, Baltic Germans. Diaspora: Ukraine, Kazakhstan, Uzbekistan, Kyrgyzstan, Baltic Republics. Many have emigrated to North and South America or back to their original homeland, Germany. Before the 1917 Bolshevik Revolution, the Germans in Russia were concentrated in three regions; the Volga region, Ukraine, and the Baltic provinces. A fourth German-populated area acquired by the Soviet Union was north east Prussia on the Baltic coast (today Kaliningrad oblast), which Stalin annexed in 1945. The first of these settlements started in the 13th c., when colonies were established along the Baltic littoral. The area was controlled by knightly organisations until they were eclipsed by Sweden and Poland in the 15th c. German culture in the Nordic baltic flourished under Swedish rule, but in 1720, at the conclusion of the Northern Wars, these lands were ceded to Russia. Shortly thereafter, Russia acquired territories along the Volga and in Ukraine from the Tatars and from the Ottoman empire. The Russian government wanted to colonize these areas quickly, and Russian agents were sent throughout the overpopulated Germany soliciting settlers. Thus, a second group of Germans came under Russian rule. Catherine II issued a manifesto which granted Germans religious freedom, self-government, local control of schools, and freedom from military and other state services. The peak years of settlement were 1764 through 1774. The Germans made a success of the program, trekking eastwards and colonizing new land. Therefore, an identical program was used to encourage German immigration into Ukrainian areas acquired from Poland in 1772, and to areas along the Black Sea acquired from the Ottoman empire in 1804. The German immigrants suffered great hardships. In 1767, the Germans became serfs in all but name, as a law was enacted that forbad them to engage in any craft other than agriculture. This was a clear violation of the 1764 laws. The Russian governments failure to deliver seeds on time each spring, harsh winters and torrid summers, Tatar raids and general homesickness, made their hardships even tougher. Many emigrated - to Germany, to the Baltic provinces, or to America. 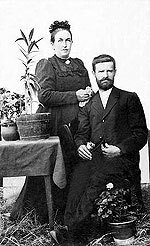 The first good harvest of the Volga Germans appeared in 1775, and by 1940, the Saratov region had in fact become Russia's bread basket. When the Bolshevik Revolution broke out, the Germans were divided as to whether to support the Reds or the Whites. In the Balic provinces, where most of the Germans were merchants and landholders, they generally supported the Whites, whereas in Russia proper and Ukraine, a majority supported the Bolsheviks who promised land and peace. In 1918, the "Autonomous Communes of Volga German Workers was established, and by 1924 it became the first autonomous ethnic region of the Soviet Union, the "Volga German Autonomus Republic" as part of the RSFSR. It was later abolished. During Stalin's brutal collectivisation in the 1930s, many Germans were exterminated as "counter revolutionaries". The most important event in shaping their Soviet destiny, however, was the Nazi-German attack on the Soviet Union in the summer of 1941. All Germans in the soviet Union were declared to be a fifth column. The Volga-Germans were deported to Central Asia, Siberia and North-Caucasus. There were already more than 100,000 Germans in southwestern Siberia and Kazakhstan, as a result of migration during the tsarist period. After the war, the Soviet government began a denationalisation program, whereby Germans were denied the opportunity to maintain their language and culture. In 1959, only 43% of the Germans stated that they spoke German at home. By then, their situation had already started to improve, however, as Khrushchov began to loosen the old Stalinist restrictions. In 1964, Khrushchov abolished the decree by which Stalin declared the Germans to be a fifth column. In 1972, the Germans were allowed to return to the Volga-region, but no mass migration took place. Since the beginning of Gorbachovs reforms in 1985, the possibility of establishing a German Republic in the Volga region has been discussed. The Germans have shown little enthusiasm for the proposal. Germans of Kazakhstan have later made a demand to create an autonomous republic of Kazakhstan to substitute the Volga-republic. The restoration of German national districts within some of Russia's 89 federation subjects has also been discussed. A difficult issue is the question of establishing a German Republic in the Kaliningrad oblast. This idea was supported by the 1990 Convention of USSR Germans in Moscow and various German organisations in Russia. German population in Kaliningrad is rapidly increasing (from 200 in 1989 to 4,000 in 1993 despite restrictions). After perestroyka, more and more Germans emigrate to Germany.